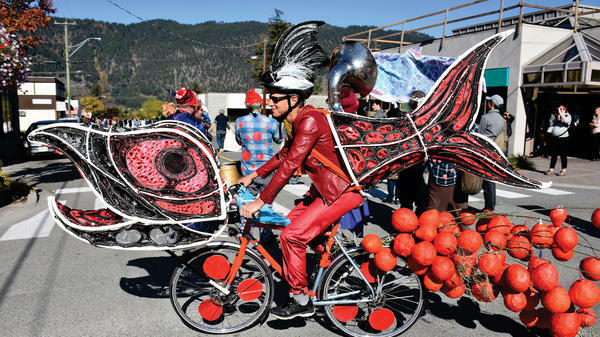 Costumed activists riding elaborately decorated bicycles paraded down the streets of Vancouver last month to bring attention to the challenges facing the sockeye salmon population in the Fraser River and its connection to Canada's indigenous people. This year's Wild Salmon Caravan followed the trail of sockeye salmon from the Salish Sea to their spawning grounds far inland and incorporated the customs and costumes of the indigenous peoples of British Columbia for whom salmon is sacred. Participants in Canada's Wild Salmon Caravan fear the wild sockeye that spawns in the Fraser River is being threatened by salmon farming, pollution and dams. At 10 a.m. on Sept. 22, Granville Street in Vancouver turned into a river. Brightly colored cardboard salmon, bicycle floats and hundreds of people dressed in costumes flowed down the street, carrying huge silkscreen banners and flags as big as sails printed with the words "Wild Salmon Forever." People sang, beat drums and called the wild salmon home. It was Day One of the weeklong Wild Salmon Caravan: the fourth annual 250-mile pilgrimage which follows the yearly migration of sockeye salmon up the Fraser River, from the Salish Sea near the U.S.-Canadian border to the mouth of Adams Lake in interior British Columbia. It's known as one of the country's most important salmon spawning grounds. 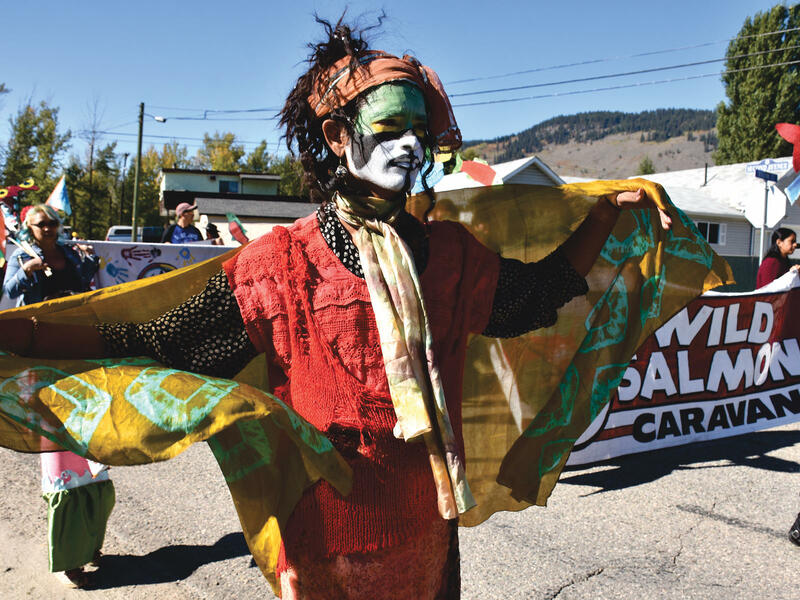 "The Wild Salmon Caravan is a celebration of the spirit of wild salmon through arts and culture," says Dawn Morrison, one of the caravan's founders. Morrison is a member of Secwepemc Nation from the south-central part of British Columbia. Salmon is a staple food, integral to the culture and identity of many different indigenous peoples here. It's used in traditional ceremonies and in community feasts. It is baked, roasted over an open fire, canned, smoked or dried to be eaten over the winter. "We're calling on all the nations to help us honor this amazing species and the wealth and abundance that it has generously given us for thousands of years," Morrison says. But the caravan is not just a celebration — it's a call to action. Although the natural salmon population cycle contains predictable dips, in the last three years, the Fraser River has seen some of the lowest numbers of salmon returns in its recorded history — "abysmal," says Mike Lapointe, chief biologist of the Pacific Salmon Commission. Scientists blame the low returns on a giant patch of warm water in the northeast Pacific Ocean called "the blob" that has affected fishing all along the Pacific Coast in the last few years. And while 2018 was predicted to be a peak year in the Fraser River sockeye salmon's four-year cycle — with some predictions of up to 14 million fish returning to spawn — abnormally warm ocean conditions suggest the return will be closer to 11 million, says Lapointe. "The salmon are running a marathon a day. Warmer temperatures make it much harder for them," he says. The threat to wild salmon populations of the West Coast has been going on far longer than the blob has been around. Tens of millions of salmon ran in North America's Western coastal rivers before the Europeans arrived. According to some estimates, the population has shrunk to 0.1 percent of that now, thanks to damming, development and pollution. While the Fraser River has a relatively stable sockeye population, it is not immune to the impacts of development and over-fishing. Over the years, Morrison saw the downward trend and came up with the caravan as a way to bring attention to the fish's plight in a way that would be both creative and provocative. The kick-off parade in Vancouver brought local farmers, social justice organizations and local food system advocates together. After the parade, an afternoon event included poets, musicians, artists, academics and activists from all over the country. The theme of this year's caravan was mermaids – but not the Disneyland kind. In the Shuswap language of the Secwepemc Nation, the term Qelmucw etkwe means "water people." Morrison says the theme is inspired by stories from around the world that contain human-like creatures that defend water and pass between human and aquatic worlds. "The water people symbolize transformation and change between different beings," she says. "The stories carry a lot of deep meaning, and that's how we explain the unexplainable – the mysteries of the ocean, rivers and lakes." At the parade in Vancouver, the water people sported flamboyant mermaid tails and colorful full-body make-up. "Every year there's always something new and something fresh," says Eddie Gardner, president of the Wild Salmon Defenders Alliance and a co-founder of the Wild Salmon Caravan. "The creativity is just magnificent." Gardner says the creativity can lead to greater awareness of the threats facing wild salmon, which can then help people work together to protect the species. Wild Salmon Defenders Alliance opposes industrial open-net salmon farming, which they say contributes to marine pollution, spread of disease and the contamination of the genetics of wild salmon populations when farm-raised salmon escape. It also raises awareness about the impacts of forestry, mining and pipelines on native salmon populations. Lapointe says while local people can't reverse the effects of warming ocean and river temperatures, they can give the salmon a greater chance of survival. "The big question is, how fast can salmon adapt compared to how fast temperatures change?" he says. "The salmon in the Fraser River are doing relatively well, and I think it's because people are seeing the changing conditions and doing what they can to help the salmon survive." From Vancouver, the Wild Salmon Caravan made its way to Chilliwack (Stó:lō territory), where they had lunch at a local village center with elementary school students. 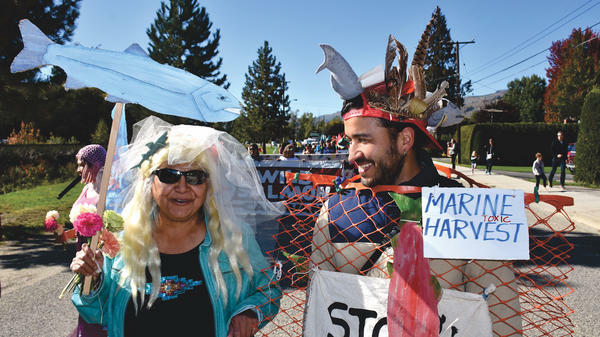 The caravan then followed the salmon migration to Lillooet (St'at'imc territory), where they held a local forum about wild salmon, feasted and conducted ceremonies with local communities. They then went to Merritt (Nlaka'pamux territory) where they paraded, feasted, held art workshops and told stories, and then onto Kamloops (Secwepemc territory) for more ceremony and feasting. By visiting communities along the Fraser River, the caravan hopes to create a sense of collective purpose and identity among nations. "[It's] an energizer to do something really positive," says Gardner. The final stop at the end of the week was Morrison's home — Secwepemc territory on the shores of Adams Lake in Chase, which is where a majority of Fraser River sockeye salmon go to spawn and die at the end of their epic migration. On the final day of the caravan, the group offered tobacco to the water to honor salmon, its home and habitat, and the shxweli, which is a Stó:lō word for the life spirit contained in salmon and all the creatures it supports. "[W]e want to raise the consciousness of how resilient wild salmon are as a species," Gardner says. "Let's build on this growing, powerful collective force to ensure that we have wild salmon for future generations. We must restore and conserve them ... because as the salmon go, so do we."